Journey to the West features a group of Chinese tourists visiting Europe for the very first time. This road movie captures the cultural differences between China and Europe through a play of mirrors and contrasts. The film premiered at the Festival International Du Film Francophone in Belgium in 2015. Join us for the Singapore premiere of Journey to the West, followed by a post-screening talk by Assistant Professor Sin Harng Luh from National University of Singapore. The Alt Screen series features Asian cinematic stories that offer critical perspectives and interpretations of global issues. 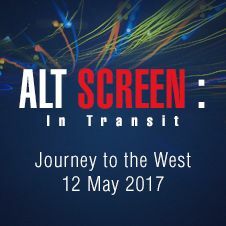 In this second edition, Alt Screen: In Transit explores the mental, physical, and spiritual journeys taken by modern man, through stories that examine the notions of travel, transience and transition. Free admission. Please register at the library eKiosks or http://www.nlb.gov.sg/golibrary2/e/alt-screen-in-transit-63262180. Harng Luh is an Assistant Professor in the Department of Geography at the National University of Singapore. Her research focuses on the mobilities of people—in the broad spectrum from tourism to migration, as well as the mobilities and fluidities of abstract idea(l)s such as moral and social responsibilities, ethics, and care (at a distance), and how these translate into real practices on the ground. Her work has explored the ethical and responsible possibilities enacted in tourism, situated within the larger context of social initiatives like sustainable development, ethical consumerism, and ‘first world responsibilities’ to the ‘third world’. Her current research project studies the everyday practices people make in/on social media, and how these are translated into travel/tourism practices on the ground.